Sausage Party is easily one of the more unique-looking films coming out this year. 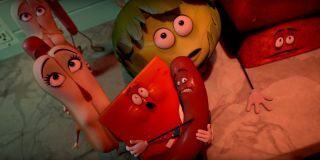 Seth Rogen's R-rated animated comedy got a red band trailer a couple months ago, and while the latest promo omits the swearing there's still plenty of human-on-food violence (and laughs) to be found. This looks to be a curious mix of weird and clever, and it'll be interesting to see how far the Pixar parody goes when it comes to profanity and vulgarity. In any case, the exemplary voice cast alone has me looking forward to checking this one out. Directed by Greg Tiernan & Conrad Vernon, and starring Seth Rogen, Kristen Wiig, Jonah Hill, Bill Hader, Michael Cera, James Franco, Paul Rudd, Salma Hayek, and Edward Norton, Sausage Party is scheduled to open in US theatres on August 14, 2016, before opening in UK cinemas on September 2, 2016.